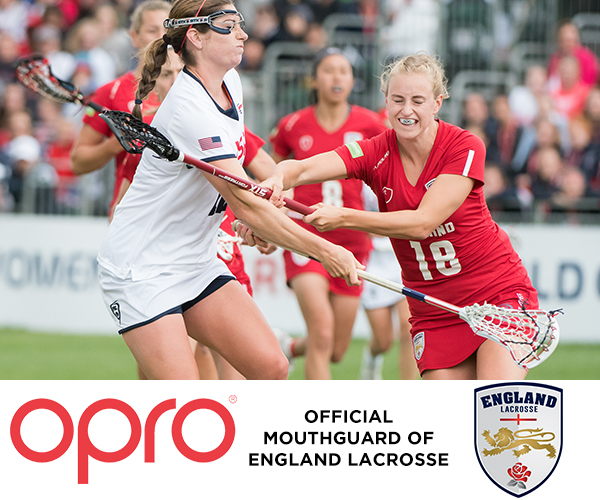 Having worked alongside England Lacrosse for the past 15 years, the agreement formalises OPRO’s partnership with the governing body at an exciting time, as the former English Lacrosse Association and England National Teams now sit under one brand as England Lacrosse. The long-term deal will see OPRO support lacrosse players at all levels, providing them with the highest level of protection for their teeth. It comes at an exciting time as they look to raise the profile of the sport, fostering the development from grassroots through to elite level. OPRO is the official mouthguard partner of a number of professional sporting organisations, including GB and England Hockey, Irish Hockey, USA Rugby, England Rugby, New Zealand Rugby, Australia Rugby, 11 AVIVA Premiership Rugby teams, England Hockey, England Boxing, the Gaelic Athletic Association (GAA), the WGPA (Women’s Gaelic Player’s Association), the UFC and the German, French, Italian, Cameroonian and Northern Ireland Mixed Martial Arts Federations. All OPRO mouthguards are legally CE certified and in 2007 the company was awarded the Queen’s Award for Innovation in recognition of its ground-breaking work in the field of oral protection. For more information, visit www.opro.com, www.opromouthguards.com and follow OPRO on Facebook at www.Facebook.com/OPROmouthguards, on Twitter @OPROGroup, on Instagram @OPROGroup or contact info@oprogroup.com. England Lacrosse is the national governing body for lacrosse in England. It is responsible for the development and governance of the sport from grassroots level through to England National Squads competing at World Championships.